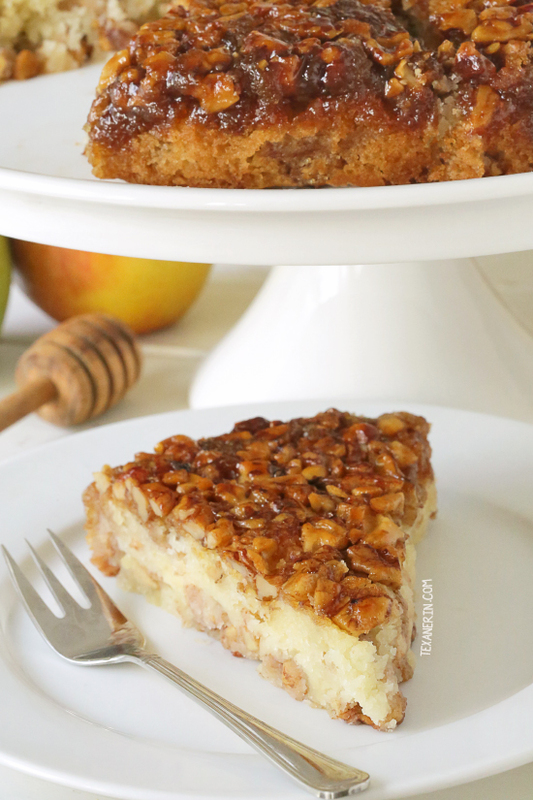 Today’s upside down apple honey cake isn’t exactly international but it is maybe a little multicultural! I’ve seen a few recipes for Jewish apple cakes and was intrigued. They seem to be traditionally made in a tube pan, which I don’t have, and I just made an apple bundt cake, so I thought I’d go with something smaller. Jewish apple cakes also don’t usually seem to involve honey, so I added a delicious honey sauce and turned my cake into an apple upside down cake. The original was made with all-purpose flour, but I used a mix of gluten-free flours and made another version with white whole wheat flour. These whole wheat apple muffins also have honey in them and are a bit easier to make than this apple cake! Rosh Hashanah is the Jewish New Year and dipping apple slices into honey is one of the food customs associated with it (you can read more about that here). I thought it’d be nice to make an apple and honey cake for Rosh Hashanah, but I got the date wrong and thought about keeping this recipe for next year. Then some lovely people on Instagram informed me that Yom Kippur, which is the holiest day of the year for the Jewish people and involves fasting for nearly 26 hours, is this week and that this cake would be great for breaking the fast. Thanks so much to those people! I was seriously so bummed about having missed Rosh Hashanah by a few days. This idea I had of making an apple cake every Monday (like this French apple cake or this Swedish apple pie) was a little birdbrained on my part. Rarely do cakes ever work out on the first or second tries for me. I’m rocking an average of four attempts per cake before nailing the recipe. :D But this apple upside down cake was totally worth it! It absolutely doesn’t taste gluten-free (at least it doesn’t with the mix of flours I used) and is honestly one of the best cakes I’ve ever eaten. I found the cake recipe on Smitten Kitchen but the source is unknown. Several commenters said their mom made the exact same recipe and one commenter thinks it came from The New York Times Heritage Cookbook. Wherever it came from, it’s magical. Let’s see where I went wrong. Attempt 1: Delicious but a little too dense. I looked at my calculations again (I only made a fourth of the recipe) and I used 10x (seriously) the amount of tapioca starch I should have. Whoops. Attempt 2: Perfect! Time for a full-sized cake. Attempt 3: I wanted to make the cake in a 9″ pan but I only had a springform pan of that size. Who knew that the honey sauce would leak and create a huge mess in the oven? I guess most people? ;) I sure didn’t. I took that cake and flipped it into a 10″ pan. I swirled it all together and it was delicious. Attempt 4: This is the version you see here. I used a 10″ closed cake pan and I lined just the bottom with a piece of parchment paper. Everything was going well until I checked it after it had cooled for about 20 minutes. Apparently the toothpick test doesn’t work with this cake! It was still not cooked all the way through. So back to the oven it went. When I flipped it out, the nuts around the edges stuck to the pan. They were really easy to put back on the cake and I don’t think you could tell, but I still recommend just placing a piece of parchment paper in the pan. Not lining just the bottom, but having a full sheet that goes over the bottom and up the sides. That’s how I did the first two and fifth cakes and it worked beautifully! That way nothing will leak and there won’t be any issue with nuts sticking. Not really into apples? Try this strawberry rhubarb upside down cake or this easy blueberry upside down cake! 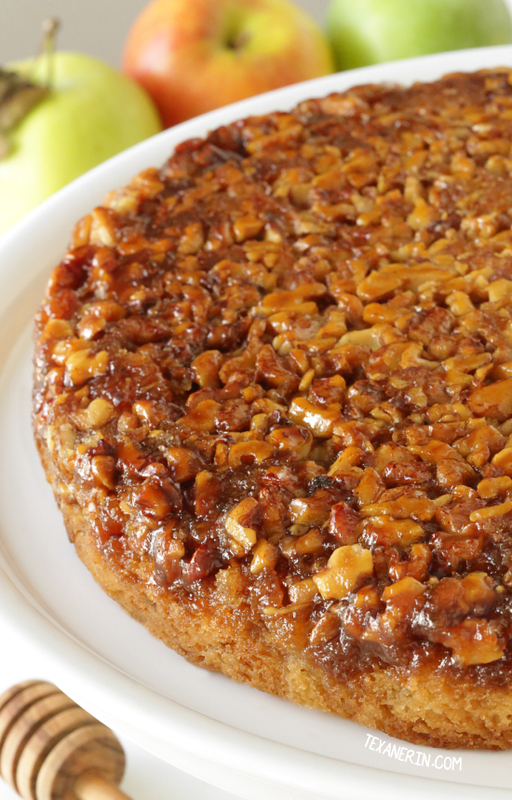 This Gluten-free Pineapple Upside Down Cake from Noshtastic also looks awesome! Position the oven rack to the middle position of your oven. Preheat the oven to 350 °F (175 °C) and place a piece of parchment paper over a 10" (25.4cm) cake pan (dark and glass pans aren't recommended). Do not line just the bottom of the pan! Place a full piece of paper over the pan so that the entire thing is lined. Mix together the honey, coconut oil, maple syrup, vanilla, cinnamon and salt. Stir in the walnuts. Spread the honey sauce over the bottom of the parchment-lined pan. Place the pan in the refrigerator while you prepare the rest of the cake. This makes it easier to spread the cake batter on top. In a large mixing bowl, stir together the melted coconut oil, sugar, orange juice, vanilla and eggs. Set aside. Peel, core and cut the apples into small pieces, about 1/4" in size. You can make larger pieces if you like, but it'll make the cake more difficult to cut. Place them in a bowl and stir in the cinnamon and sugar. Add the dry cake mixture to the wet and stir just until combined. Remove the cake pan from the refrigerator and pour half of the cake batter over the honey sauce. It will be a very thin layer. Sprinkle half of the apples (about 1 1/2 cups + 2 tablespoons) over the batter. Add the remaining cake batter (again, a very thin layer). It's okay if the apple layer and cake layer blend together a little. Then add the remaining apples. Once it's all done, it won't look like much but it will rise a lot. The reason why I didn't just add the apples to the batter is so that they retain their cinnamon sugar coating. I'd also be worried about the apple pieces interfering with the honey sauce layer. Bake for 50 minutes or until very lightly browned. The toothpick test does not work here! Once it's lightly browned, you'll have to dig in just a little with a fork or knife to see if it's really done. Let the cake cool on a cooling rack for 10 minutes before inverting onto the serving plate. The cake will be quite fluffy and therefore a little difficult to get a clean piece when cutting. It'll be easier after about 6-8 hours. After sitting overnight, the cake is a little denser and almost like a coffee cake and much easier to cut. I chopped mine quite small so that the cake would be easier to cut and toasted them at 350 °F (175 °C) for 5-7 minutes. 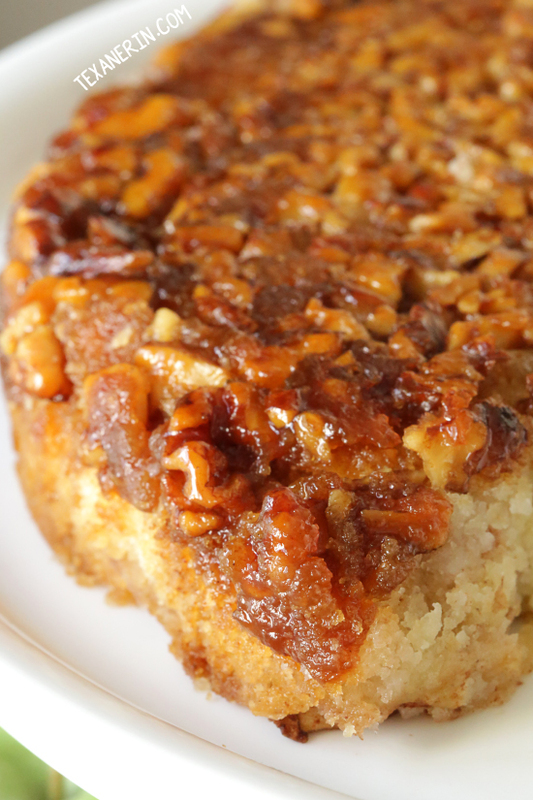 112 comments on “Apple Upside Down Cake with Honey (gluten-free, whole grain options and dairy-free)” — Add one! 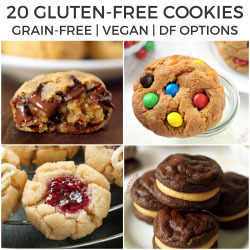 Do you think this recipe would work with a Paleo baking flour mix, like Bob’s Red Mill? I haven’t tried it but I don’t think it would. Sorry about that!